Our Teachers Our qualified instructors have years of experience teaching English as a second language, domestically and internationally. Each teacher holds a minimum of a Bachelor’s degree / Master’s degree and TESOL Certification. They are devoted to creating a lively, challenging learning environment that allows you to make maximum progress with both your spoken and written English. During your course, you will learn practical academic and communication skills along with the most useful vocabulary, grammar, and communication skills. Your teachers will provide student focused classes for learning that strive for academic advancement. 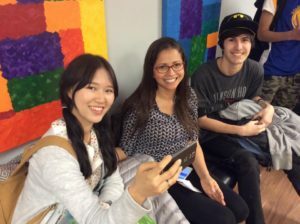 *Our Center Balanced Nationality Mix Internexus San Diego hosts students from all over the world! *Great Location You will find great trendy (Popular place) coffee shops, restaurants and parks just outside our door. Just 10 minutes from downtown San Diego. Free Parking! *Excellent Free Tutors We also offer free conversation partners! Our experienced tutors know exactly how to get you speaking right away. *Modern Technology Our freshly remodeled classrooms are equipped with flat screen TV’s and free Wifi. All the classrooms have chrome cast. *TOEFL Practice Our school is equipped with laptops for practice TOEFL testing and self practice for all levels. (Coming Soon!) Internexus San Diego also has loads for TOEFL practice exams.